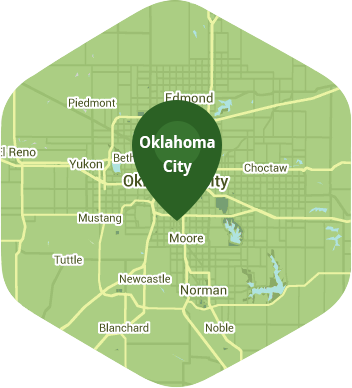 Book a skilled lawn pro in Oklahoma City. Backed by a total satisfaction guarantee and amazing customer support. Oklahoma City is known for its sports, commerce and culture. There is a park in each city quadrant and plenty of awesome restaurants that serve authentic southern cuisine. These are just a few of the reasons why OKC is an awesome place to be in. It would be great if you could spend your weekend exploring the city instead of aerating your lawn. Let Lawn Love handle your lawn aeration needs because it is one of the things that we do best. Aerating your lawn is just as important as mowing it. Aeration involves the perforation of your soil with small holes which makes it possible for water, nutrients, and air to penetrate the grass roots. This will help the roots grow more deeply which can translate to your lawn looking more vigorous. The main reason why your lawn needs to be aerated is because it can help alleviate soil compaction. Compacted soil contain a high amount of solid particles in a certain volume or space, and this can prevent air, water, and nutrients from being properly circulated within the soil. Lawn aeration treatment just happens to be one of Lawn Love's specialties. Our independent lawn care experts are familiar with the different kinds of grass that are unique to the Oklahoma City region, and have an average of 10 years of experience. You can call now at 405-926-8318 to book our services, or get a free two minute quote to get a price estimate. Rated 4.75 / 5 stars in 3,719 Oklahoma City customer reviews. There won't be any rain in Oklahoma City today, which means you'll probably have to water your lawn. Dusk and dawn are the best times to water your lawn (the sun will rise at 6:47 AM and set at 8:09 PM today in Oklahoma City). Here are some average aeration prices for homes in Oklahoma City. Average lawn size 4,145 sq. ft.